The Muralidharan lab moved down the hall to a bigger lab space. Thanks to the CTEGD leadership, the lab can grow in the coming years. This space has seen some excellent, ground breaking science as the former home of the Stripen lab. Hope we can fill those big red shoes! Ale Villegas and David Anaguano join the team! Welcome to the Muralidharan lab! Our enterprising student, David Cobb, won the second prize at the Cellular Biology retreat for his exciting talk on the reductive power of the ER in malaria parasites. Our proposal to study the interplay between the ER and cellular signaling was awarded (R21 AI133322). Anat won a 2-year American Heart Association postdoctoral fellowship to study the functions of the malaria plastid in the hopes of identifying new parasite-specific drug targets. Thanks to the trainees in the Department of Biochemistry for inviting and hosting me at UTSW! We are thrilled that Carrie Brooks has joined our team as our lab manager! She is an amazing scientist with a wealth of experience working on apicomplexan parasites. 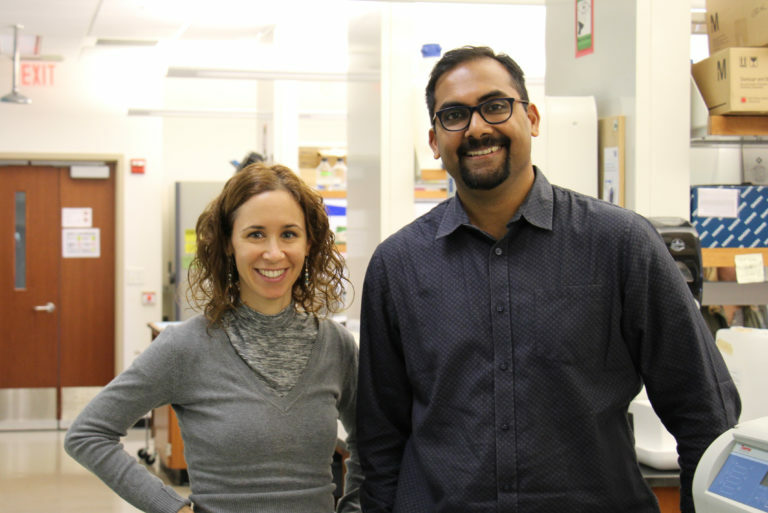 Thanks to all the hard work by the members of the Muralidharan lab, we were awarded a five year NIH R01 grant, $1.9 million over 5 years ( R01AI130139)! The lab receives a NIH grant! Heather wins the ARCS award!